Facebook offers the ability to its users to create a group on a specific subject or interest and ask friends and acquaintances to join and share information which is entirely driven by them. 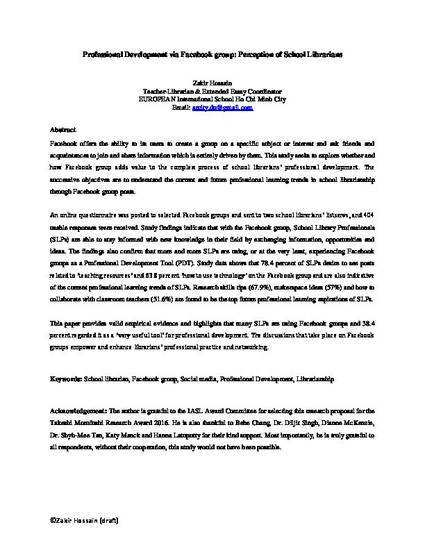 This study seeks to explore whether and how Facebook group adds value to the complex process of school librarians’ professional development. The successive objectives are to understand the current and future professional learning trends in school librarianship through Facebook group posts. An online questionnaire was posted to selected Facebook groups and sent to two school librarians’ listservs, and 404 usable responses were received. Study findings indicate that with the Facebook group, School Library Professionals (SLPs) are able to stay informed with new knowledge in their field by exchanging information, opportunities and ideas. The findings also confirm that more and more SLPs are using, or at the very least, experiencing Facebook groups as a Professional Development Tool (PDT). Study data shows that 78.4 percent of SLPs desire to see posts related to ‘teaching resources’ and 63.8 percent ‘how to use technology’ on the Facebook group and are also indicative of the current professional learning trends of SLPs. Research skills tips (67.9%), makerspace ideas (57%) and how to collaborate with classroom teachers (51.6%) are found to be the top future professional learning aspirations of SLPs. This paper provides valid empirical evidence and highlights that many SLPs are using Facebook groups and 38.4 percent regarded it as a ‘very useful tool’ for professional development. The discussions that take place on Facebook groups empower and enhance librarians’ professional practice and networking. Hossain, Z. (2017, draft). Professional Development via Facebook group: Perception of School Librarians. Unpublished.